A true warrior accepts any challenge. Even when there is a lumberjack competition, ready to rally warriors from all over the world. Or maybe perhaps because of it! Only a distinguished fighter can use his speed, powerful techniques and strong will to face up the challenge and become the lumberjack champion. Are you ready to show the world what you are capable of? 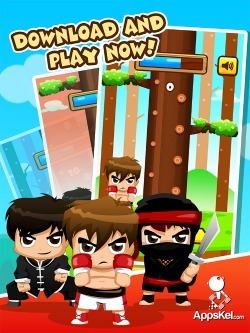 Do you have what it takes to be a street fighter or a ninja? Put your fists into use. It's time to punch some branches, cut down some trees and become a champion. A quick-paced gameplay awaits you. 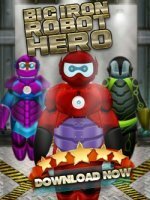 This is a free, intense and highly competitive game. You take control of a fighter and cut down trees, while looking out for falling branches that might kill you. The game starts out with a boxing character, but there are 9 unlockable fighters ready to heed your commands and follow the path to victory. As with any true competitive game, this one lets you share your score on social media (Facebook or Twitter). Compare your achievements with others and let them know that it is you who will set the new record in lumberjacking! 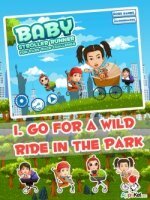 This app's gameplay is simple but very fast-paced and highly competitive. Your goal is to cut down the trees that are located in the center of your smartphone screen. However, there are branches falling at a very fast speed which makes things harder for you. You have to be constantly on guard and look out for falling branches. If any of them falls on your character, then he dies and it's game over. You can move your fighter to avoid falling branches and continue cutting down the trees. You can do so by tapping left or right on the screen. This will set the direction in which your character will move to avoid the branches. You will need quick reactions and fast fingers to carve your way to victory. Lumberjack Warriors starts out with only one available type of fighter – a boxing professional. However, there are nine other locked characters, each of them coming from a distinctive fighting school: Kung Fu, Mixed Martial Arts, Karate, Sumo, Ninja, Jeet-Kune-Do, Muay Thai, Tae-Kwon-Do and Street Fighter. Every locked character comes with his own unique fighting technique. There are two ways to unlock these master warriors. 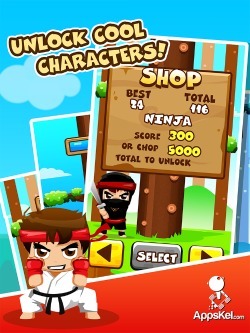 You can accumulate a certain amount of chopped trees and reach a score checkpoint. You can also unlock all the fighters by making an in-app purchase which has a fee of $2.99. The game is free. If you wish to remove in-game ads you can do so for a small fee of $1.99. 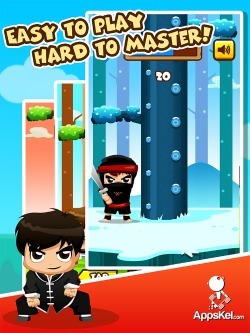 As Lumberjack Warrior has a strong competitive edge, the game involves scoreboards. You can proudly show the world your achievements by sharing the number of chopped trees or score on social media (Facebook or Twitter). This way you will establish yourself as the global lumberjack champion and everyone will know about your mastery.